"Your margin is my opportunity," Amazon CEO Jeff Bezos has said. With Amazon's Whole Foods acquisition, he's staying true to this core business tenet. Amazon.com (NASDAQ:AMZN) has all of the permissions in order to close on its acquisition of Whole Foods Market (NASDAQ:WFM), which was first announced in May. The acquisition will close on Monday, Amazon said in a press release on Thursday. Though Amazon's official acquisition of Whole Foods is notable news, the most interesting information that surfaced in Amazon's press release about the acquisition was the e-commerce giant's plans to begin cutting prices immediately -- a move that has the potential to rapidly accelerate Whole Foods' sales and subsequently help the health foods grocer gain market share. Here's a close look at Amazon's ambitious plans for Whole Foods. Jokingly referred to by many as "Whole Paycheck," Whole Foods revenue growth ran into significant headwinds in recent years as larger grocers with more scale started bringing organic food to their stores at lower prices. With lower-priced organic food available at other stores, Whole Foods customers had less incentive to shop at the high-end store. 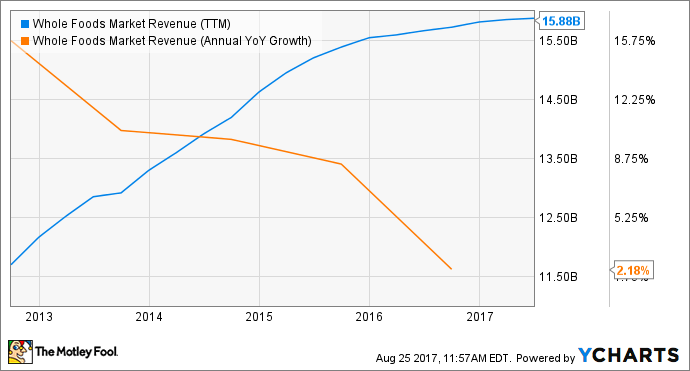 WFM Revenue (TTM) data by YCharts. Amazon is well aware of Whole Foods' premium prices, and that's where it's focusing its efforts first. Beginning Monday, Whole Foods will slash its prices on "a selection of best-selling grocery staples," said chief executive of Amazon Worldwide Consumer Jeff Wilke. Initial popular staples to get a price reduction will include organic bananas, brown eggs, apples, butter, and chicken, animal-welfare-rated 85% lean ground beef, almond butter, and "much more," Amazon's press release said. By taking aim at staple items, Whole Foods' store traffic and sales could see an uptick quickly. The move to lower prices is in line with Amazon's general business philosophy. The e-commerce giant has little interest in premium margins. As Amazon founder and CEO Jeff Bezos has famously said, "Your margin is my opportunity." This is "just the beginning"
In its press release about Amazon's plans to lower Whole Foods' prices, the company was sure to inform investors that these first price cuts are "just the beginning." Wilke said Amazon will "continuously lower [Whole Foods'] prices as we invent together." The ever-expanding flywheel effect of Amazon's Prime loyalty will continue with the company's acquisition of Whole Foods. "In the future, after certain technical integration work is complete, Amazon Prime will become Whole Foods Market's customer rewards program," Amazon said, "providing Prime members with special savings and other in-store benefits." To pull this off, Amazon and Whole Foods will first need to integrate their logistics and point-of-sale systems. Bringing Prime to Whole Foods will not only help bolster Prime loyalty, but it could bring many new customers to Whole Foods. While Whole Foods does boast superior profit margins compared to many of its competitors, allowing Amazon to make some immediate price cuts, the two companies will need to innovate together in order to support ongoing price decreases. To improve operating efficiencies and subsequently give Whole Foods more leeway for further price reductions, the two companies are turning to Amazon's merchandising and logistics expertise. By inventing together in these areas, Amazon believes this will enable even lower prices at Whole Foods. All of this sounds great for Amazon. But proposed acquisition synergies often look better on paper than in reality. Investors will start to see how this pans out on Monday. But it will take more time before it becomes clear whether Amazon can successfully expand to an entirely new market.